I'd posted a teeny sneak peek at Sophie's sloth painting in progress in the days before Christmas. I wasn't going to do my usual holiday paintings this year, but when it's the only thing your kid asks for, and she's such an undemanding kid anyway, you break out the paints. 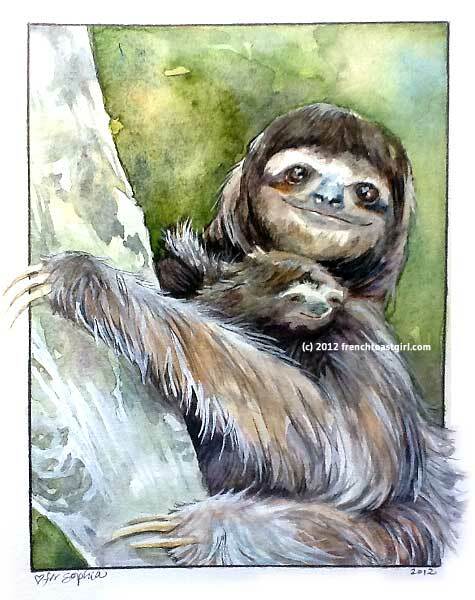 So here's the painting of a sloth and baby (her choice!) snuggling, in an old frame I hot-glued branches to. If I'd had more time/in a perfect world/blah blah blah I would have gotten a nice chunky wooden frame, and cut a nice mat for it too. You know what? Sophie adores it just the way it is, glue drips and all. And we even figured out that the tiny model-magic sloth tree ornament she made fits perfectly on that bottom branch. So I should just stop over thinking this stuff and let it be. Sophie's extremely thorough knowledge of sloths came in handy when it came down to details - I knew why the fur grew that way (to help keep them dry) and that adding green accents to the mama sloths was perfectly okay, as sometimes those slow-moving cuties actually collect algae to help camouflage them in the rainforest's upper canopy. And for some reason now, I think painting a wookiee would be a piece of cake. I am convinced sloths and wookiees are related in some galaxy somewhere. Do you see the resemblance too? What do you use to color in your drawings? Do you use water colors? or do you do it digitally with photoshop or illustrator? thanks! i love your work. 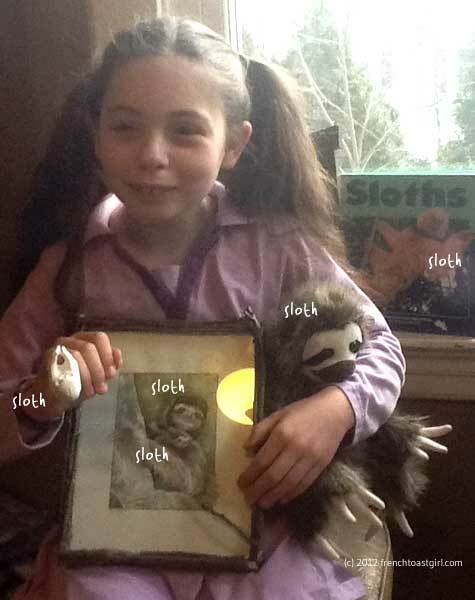 Did you see the Sloth Video??? Or rather, your daughter? 2, [url=http://www.zolofthelpsleep.net/]Zoloft For Sale[/url] - Zoloft For Sale - sertraline without prescription http://www.zolofthelpsleep.net/. 11, [url=http://www.radioflyercatamarancharters.com/]Purchase Lasix[/url] - Purchase Lasix - lasix cost http://www.radioflyercatamarancharters.com/ . 14, [url=http://www.tiptheserver.com/] Klonopin Sale [/url] - Klonopin Online - order clonazepam online no prescription http://www.tiptheserver.com/ .